I find that I have a personal barometer that I measure and alter my emotions by. My weight. I realized it this morning as I shied away from the scale. I haven’t stepped on the scale in the past two weeks due to vacations and poor eating, I didn’t know what to expect. Now, I’m well aware that the number on the scale should not affect me. It doesn’t own me, I am (or think I am) at all times in power of my body. Yet why the fear this morning? Well, I haven’t worked out as much, I ate more decadent meals, and I lost too much sleep. So what was I to do? I knew I needed a base on where my weight was after two weeks of gluttony, so I sucked it up (and in) and got on that scale. What did it tell me? Well, somehow I’ve managed to maintain/drop a teensy bit of weight. I don’t know how it happened, but I found myself immediately cheerful. Something about that darn scale gets to me. Every. Damn. Time. I don’t have a pair of skinny jeans, I don’t keep body measurements of my progress, I just base my body on that single number. Somehow seeing that I haven’t deviated off my downward path was able to improve my mood immediately. I’ve learned to become less upset about small fluctuations upward, but that lower number? Heaven. Maybe I’m learning to eat and live at a balance. Perhaps my body is plateauing again (it sure likes to do that). Whatever it is, I’m glad that I’m managing to maintain a healthier lifestyle. Hopefully my barometer will never exceed that previous tens digit (not sure I’m ready to admit it). And if it ever dare, hopefully I have the strength and determination to weasel my way back down. What about you? Do you have a personal barometer? Does any physical factor make or break your mood? Now I’ve heard the pros and cons of weighing yourself daily. Most of the advice I’ve gotten in the past tells me to weigh in weekly so I don’t get upset about fluctuation. But I find that, at a weekly weigh-in, I don’t hold myself as accountable for my mediocre eating and exercising of the previous week. On a day to day basis I can look at the scale and see how I’ve been treating myself. Yes, my weight was up two pounds the other day, but I was able to calm my (somewhat irrational) nerves. I reminded myself that I had lifted weights vigorously the day before and my body was compensating. It probably didn’t hurt that I used a more positive thinking strategy. And of course it was back down the next day, so any negative thoughts could have thrown me off my trending. So here is my issue. 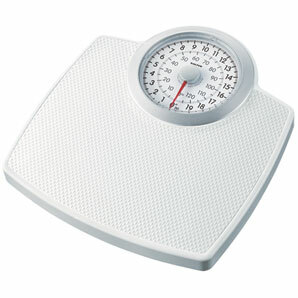 I get to look at my scale on a daily basis, which is fantastic, as long as I keep myself honest to my body and self. I’m looking for others to help keep me accountable, to ask me how I’m doing every once in a while. I may not throw a number in your direction, but every nudge is a kind reminder that this is a journey I wanted to embark on. I wanna know: How frequently do you weigh yourself and why? Where do your theories come from and how do you keep yourself accountable? On a pathetic funny note, my P90X DVD refused to function properly at 5am this morning and I was devastated. Cleaned it off at work and I’m hoping I can fit it in this afternoon (which just might make my day).